Luigi's Mansion: Dark Moon, known as Luigi's Mansion 2 outside North America and South Korea or as Luigi Mansion 2 in Japan (ルイージマンション２ Ruīji Manshon 2), is a Nintendo 3DS game, and a sequel to Luigi's Mansion, a Nintendo GameCube launch title. This is the third game to feature Luigi as the main character with Mario playing a supporting role (the first two being Mario is Missing! and Luigi's Mansion). An arcade version of the game was released in 2015. Luigi's Mansion: Dark Moon is the first game that was released as part of the "Year of Luigi," honoring 30 years since Luigi's debut. E. Gadd fleeing from the aggressive Greenie ghosts. Professor E. Gadd has been researching ghosts in Evershade Valley, with some assistance from his friendly Greenies. When King Boo appears and shatters the Dark Moon, breaking it into six pieces and scattering them to each Mansion of the valley, the once friendly ghosts become aggressive. Luigi being teleported by the Pixelator. Luigi, who is at home sleeping with his TV on, wakes up when E. Gadd suddenly appears on his TV screen. He informs Luigi about the situation and asks for his assistance. E. Gadd uses his Pixelator to teleport Luigi through the screen, much to Luigi's objection, into E. Gadd's Bunker in the Evershade Valley to search for the scattered pieces of the Dark Moon and solve this problem. Luigi must explore the Gloomy Manor not far from the Bunker, the Haunted Towers found in a forest, the Old Clockworks found within a nearby desert, the Secret Mine found in the snowy mountains, and finally the Treacherous Mansion, found above a ravine with the ocean around it. After Luigi gets 4 Dark Moon pieces and rescues two Toads in Treacherous Mansion, the two Toads give E. Gadd a security image as the other Toads did when he rescued them. Once E. Gadd fixes it for a clearer view, it's revealed that Mario is once again kidnapped and trapped in a painting. 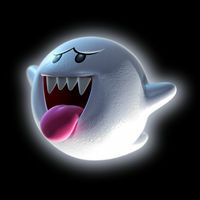 It also revealed that it was King Boo who captured Mario. Because of this, Luigi heads to rescue him in the Train Exhibit in Treacherous Mansion. It turns out the image was forged to lead Luigi into a trap, and he is ambushed by Big Boo. Afterwards, Luigi and E. Gadd ponder where King Boo and the actual painting are. But then the Parascope picks up strange readings at Treacherous Mansion's terrace. Once Luigi reaches the terrace, King Boo appears and opens up the paranormal portal and releases all of the undead. He then escapes inside with Mario's painting. E. Gadd tells Luigi to capture them all before their very dimension collapses. Luigi succeeds at this and promptly enters the Paranormal Portal, where he reaches the final area of the game, King Boo's Illusion. After Luigi obtains the last Dark Moon piece from the Tough Possessor within the illusion, E. Gadd attempts to pixelate him back to the Bunker, but King Boo interferes, sending him back to King Boo's Illusion. There, Luigi sees Mario's painting, but King Boo appears and reveals that he broke the Dark Moon in order to put all the ghosts under his control. King Boo also explains that he believes he is the rightful ruler of the Mushroom Kingdom, and wishes to conquer it with his new army. He plans to put Luigi and his friends in paintings as well, and proceeds to battle him. Luigi sleeps with his new Polterpup at home. He succeeds in capturing King Boo, claims the jewel from his crown, and returns to his dimension with Mario's painting. Luigi then meets up with E. Gadd at Treacherous Mansion's Terrace. Mario is freed by Luigi's Dark-Light, and the Toad assistants appear with the Dark Moon pieces. Luigi and the Toads then rebuild the Dark Moon and the ghosts in Evershade Valley returning back to friendly again. E. Gadd releases them from the Vault and they start playing with Mario and company. Even the Polterpup who is constantly attacking Luigi throughout the game has become amiable, and he walks up to Luigi and whimpers. Luigi says "Come here, doggy" resulting in the pup befriending Luigi. E. Gadd smiles as Mario gives him a pat on the back, proud of his brother for overcoming his fears. Then, a Greenie comes in and takes a photo of Luigi and his allies. Luigi returns back home and hangs the picture on his wall. He then goes to sleep on his couch, and his newly-adopted Polterpup comes and naps with him. It is revealed afterwards, during the credits, that E. Gadd went back to his research on the Ghosts of the Evershade Valley with Luigi joining him for sometime before returning home with the Polterpup. It is shown that Luigi spends a large amount of time with the Ghosts now that the Dark Moon is back. Luigi sucking up two Greenies. In this game, the Dark Moon has shattered and Luigi needs to find the Dark Moon pieces. There are 5 mansions in the main game (with a separate sixth mansion being exclusive to multiplayer mode), which house multiple missions in them and share a puzzle-oriented theme. This game also introduces the Poltergust 5000, an upgrade to the 3000 model. Shining light via flashlight is no longer sufficient to stun the ghosts in the game; players now need to activate the Strobulb to stun ghosts. Luigi is also now able to jump while capturing a ghost to dodge incoming projectiles. The Flash Light has another feature called the Dark-Light Device, which shines a rainbow colored light to find things such as the path of Boos or invisible objects. 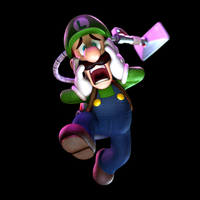 Luigi is also given the Dual Scream, which is an original Nintendo DS. It acts the same way as the Game Boy Horror and displays a map on the 3DS's bottom screen. Cash and gems help with the mission score, as well as with upgrades to the Poltergust 5000. There is also an "extra life" system. The Gold Dog Bones found in certain objects serve as extra lives; this will cause a Polterpup to take the bone and revive Luigi just by licking his face when Luigi loses all of his HP. Luigi can still yell using the D-pad, as well as hum with the music if standing still for a while. The various Toads that are trapped in paintings each have a different fear which requires more problem solving. There is a Boo in each mission that when captured works towards additional missions. Unlike its predecessor, Luigi's Mansion: Dark Moon includes a multiplayer mode called the ScareScraper (known as Thrill Tower in European and Australian versions), a series of floors where up to four players can play. The ScareScraper can be set to have 5, 10, 25, or infinite rooms. There are also three difficulty settings: normal, hard, and expert (none of which are available on Endless mode due to the progressive difficulty system). The game mode is compatible with both local, download and online multiplayer. Upon completing Dark Moon Quest, the game's story mode, the player will earn an E. Gadd medal on their file above the playtime. If the player earns a 3-star rank on every mission (which requires capturing every Boo to unlock the bonus missions), they will be rewarded with another one. Finally, the last E. Gadd medal can be earned by completing the entire Vault: this includes collecting every Gemstone, Boo, Poltergust upgrade, and capturing every normal and boss ghost from Evershade Valley and ScareScraper at least once. Earning all 3 medals will make the player's file gold and sparkly. An overhead view of Evershade Valley. Unlike the first game, where there was only one mansion, Dark Moon features different themed mansions that Luigi can explore, thanks to E. Gadd's Pixelator teleport system. The game has six mansions in total (one mansion is exclusive to Multiplayer), each with a theme in a similar fashion to the mainstream Mario games, as well as a various number of missions within each mansion. Paranormal Dimension - A dimension where ghosts and spirits live. Bonus Challenges - Areas where Luigi has to perform specific tasks in a short time limit, which rewards him with a Gem or Gold Bars. King Boo's Illusion - An area that Luigi is sent to when King Boo intercepts the Pixelator. The final battle with King Boo takes place here. ScareScraper (Thrill Tower in PAL versions) - A multiplayer-exclusive mansion. Bunker - E. Gadd's lab outside of Gloomy Manor. Amethysts - Collection of gemstones from Gloomy Manor. Emeralds - Collection of gemstones from Haunted Towers. Rubies - Collection of gemstones from Old Clockworks. Sapphires - Collection of gemstones from Secret Mine. Diamonds - Collection of gemstones from Treacherous Mansion. A Greenie, a Slammer, and a Hider (top), and a Boo (bottom). This action-filled follow-up to the original Luigi's Mansion for the Nintendo GameCube launches for the Nintendo 3DS this holiday. Players can expect more haunted mansions to explore and new ways for Luigi to take on a wild assortment of ghosts in this new adventure. In addition to using the strobe function of his flashlight to stun ghosts, Luigi must solve various puzzles and reveal hidden details in the environment to unlock new areas in the mansions. For this subject's image gallery, see Gallery:Luigi's Mansion: Dark Moon. The game was originally going to be named Luigi's Mansion 2 in both European and American versions, but the latter had its name changed some time later. Early trailers featured minor differences in aesthetics, enemy placement and level design. In Old Clockworks' Mission C-5: Piece at Last, after saving Toad from his Painting, if the player heads to the Maintenance Hub, shoots the Toad across the chasm to the floor above (leading to the Service Elevator room) and makes their way to him, the Toad will fall through the metal floor. There is no explanation for this glitch. If Luigi calls with the at the same time he does something else, such as opening a door, he will put his arm down instead of using it normally. However, the animation will otherwise be unaffected. For example, when Luigi wipes his hands at the end of a level, he will only use one hand, as the other will be resting by his side. This glitch is easiest to see when Luigi gets a call from E. Gadd or picks up a gem. The glitch ends after the mission ends or Luigi is controllable again. Luigi's Mansion: Dark Moon - Gloomy Manor theme, as heard in the E3 2011 trailer. Dual Scream ringtone - The ringtone of the Dual Scream. The game has received mostly positive reviews. IGN's Keza MacDonald gave the game a 9.3 out of 10, and GameXplain gave the game 4.5 out of 5 stars. However, Gamespot's Carolyn Petit gave the game a 6.5/10, saying that it has "no shortage of charm, but difficulty spikes and a lack of checkpoints weigh heavily on the experience". The game has received a Metacritic score of 86 out of 100, based on 74 reviews. Nintendo 3DS Keza MacDonald, IGN 9.3/10 "Luigi’s Mansion 2 might be a sequel, but it’s one that shows Nintendo at its inventive best. It’s an essential game in the 3DS’ increasingly impressive line-up, and though I sometimes wished that it would leave me alone to explore more at my own pace, it’s otherwise difficult to fault a game this detailed, absorbing and masterfully made." Nintendo 3DS Oli Welsh, Eurogamer 9/10 "The cherry on top is the presentation, which is stunning by any standards, never mind for a handheld game. The exquisite animation, striking lighting and evocative set design always have their best side to a camera that never puts a foot wrong - and every angle is positioned to make the best of the 3D effect, which turns the meticulously detailed interiors into a living doll's house in your hands. It's gorgeous, as close to a playable cartoon as anything since Zelda: The Wind Waker. That's a big name to drop, but if Luigi's return doesn't quite put him in that class, it puts him in the running among Nintendo's finest. Here's hoping it doesn't go to his lovely, stupid, fallible head." Nintendo 3DS Chris Carter, Destructoid 9.5/10 "If Dark Moon was just a single-player experience, it would have been a fleeting, yet enjoyable adventure. But with the addition of an infectious multiplayer element that can't be replicated anywhere else, it makes Luigi's Mansion Dark Moon even better than its predecessor, and one of the clear-cut best games on the 3DS." As of March 31, 2014, Luigi's Mansion: Dark Moon is the 7th best selling game for the Nintendo 3DS, having sold about 3.98 million copies worldwide. Super Mario Bros.: When Luigi sees Mario's painting in King Boo's Illusion, the Super Mario Bros. Ground theme is briefly played. Also, the Fright Knight's Ghost Container description states he was a knight looking for a princess, but she was always in another castle, referencing what the Mushroom Retainers say after being saved. Luigi's Mansion: The mansion poster featured in the this game can be seen briefly on the wall during the opening. Luigi's house bears a strong resemblance to the Rank D Mansion during the end of the game. In the first Mansion, Luigi opens the main door and says "...Hello?" in a scared voice. This is a tribute to the first game's opening sequence. The Toads trapped in paintings is very similar to Mario's situation from the game, but Mario himself is again trapped in a portrait. Boos also have names that play on the word "Boo" just like in the first game. Also in the later missions in the Treacherous Mansion, and after finishing the game, Luigi calls out "Mario" when using the + Control Pad instead of calling out "Hello" or "Yoohoo", another reference to Luigi's Mansion. E. Gadd references the Ghost Portrificationizer and King Boo's painting, and in Luigi's Mansion, when he first meets Luigi, he says he "knew [their] paths were destined to cross". When he meets him Luigi's Mansion: Dark Moon, he says "he knew [their] paths would cross again". King Boo also states that his imprisonment in a painting at the end of the first game was his primary motivation for his actions in Dark Moon. Additionally, several Boos in the Japanese version are renamed after Boos from the original Luigi's Mansion, implying that they are the same characters. Mario & Luigi: Partners in Time: The Safe Room is shaped like E. Gadd's head on the outside, much like his lab on Thwomp Volcano. The DS Time Radar's idea is re-used for the Dual Scream. Mario Kart DS: By the version of the Poltergust going from the Poltergust 3000 in the original Luigi's Mansion to the Poltergust 5000 in Dark Moon, the Poltergust 4000 kart from this game is acknowledged. Mario Strikers Charged: An arrangement of pause menu background music of Mario Strikers Charged is heard in the elevator in Gloomy Manor. Both games were developed by Next Level Games, and share the exact same three composers (Mike Peacock, Darren Radtke, and Chad York). Mario Kart Wii: Many of King Boo's voice clips were taken from this game. Super Smash Bros. Brawl: The Scarescraper colors for Luigi are orange, light blue and pink, which resemble three of Luigi's alternate colors. Donkey Kong Country Returns: The spears used by Strong Greenies in the Treacherous Mansion or ScareScraper have masks on them resembling Kalimba. New Super Luigi U: Artwork for King Boo and Luigi can be seen in some Ghost Houses as a metallic sign. Mario Kart 8: Parts of the Library Piano music can be heard in the Twisted Mansion course. StreetPass Mii Plaza: A puzzle swap panel appears based on this game. Super Smash Bros. for Nintendo 3DS: The Poltergust 5000 appears as Luigi's Final Smash, replacing the Negative Zone from Super Smash Bros. Brawl. There is a trophy of Polterpup in the game as well. Luigi's blue color scheme resembles the blue Luigi color in the Scarescraper mode in Luigi's Mansion: Dark Moon. Super Smash Bros. for Wii U: The Gloomy Manor theme appears as a selectable music track on the Luigi's Mansion stage, as well as a Luigi's Mansion series cover version which includes several music tracks from the original installment and this game. 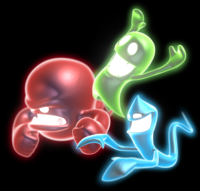 The Poltergust 5000 Final Smash reappears in this version of the game. Luigi's blue color scheme resembles the blue Luigi color in the Scarescraper mode in Luigi's Mansion: Dark Moon. Mario Party 10: The Luigi amiibo board appears based on this game, having a model of the Gloomy Manor and a sign with a Greenie on it on the board. Mini Mario & Friends: amiibo Challenge: The Mini Luigi levels are based on this game, and feature Gloomy Manor in the background (and on the world map). The house Luigi lives in appears to be the Rank D level of Luigi's NEW Mansion, although with some wear in the walls. There is a trophy over the fireplace which has a plunger and a wrench on it, suggesting that Luigi does work as a plumber from time to time. The scene when Luigi inspects his TV is a reference to a scene in the movie Poltergeist. The scene where Luigi looks down the staircase in the Hollow Tree is a reference to the movie Vertigo and the camera effect named after it. The cutscene in Treacherous Mansion where two Strong Greenies bring a suit of armor to life is a reference to Frankenstein. This is one of the rare Nintendo games that was not released on Friday in Europe. The game was released on Thursday, March 28, 2013, because Friday, March 29, 2013 was Good Friday. In some European countries, the game was released on March 27, 2013. For a limited time, players in Europe could purchase the retail version of the game with a glow-in-the-dark cover, and a Boo stress ball as a pre-order bonus. The first letters of each mansion, possessor, and bonus mission, in the order of the story, make out the word "ghost." If ScareScraper is included, it will also spell "ghosts". The trick is left intact in the German and Dutch translation. The first letters make out the words "geist" in German and "spook" in Dutch. In Dutch it only works with the first letters of the possessors and bonus missions, however. In the French translation, the first letter of each bonus mission in order read "Luigi". Though they are all labeled as mansions, neither the Old Clockworks or Secret Mine are actual mansions. ↑ (July 3, 2018). Nintendo Korea releases four Nintendo Select titles for Nintendo 3DS and New Nintendo 2DS XL Animal Crossing: New Leaf - Welcome amiibo bundle. Nintendo Korea. Retrieved July 11, 2018. This page was last edited on April 7, 2019, at 02:19.